In this modern and blase world, it seems that men, and women, can sometimes get away with anti-social behavior under the protection of the First Amendment. Our justice system isn’t perfect, but our carefully written constitution wisely allows people to speak until they hang themselves or occasionally redeem themselves. Even those who publicly disgrace our flag suffer little but public scorn. Those who offer comfort to our enemies receive little punishment, unless they embarrass the FBI. The only punishment in most cases is that the person doing these unworthy actions lives long enough to see his earlier actions re-appear in all their glory on the internet. 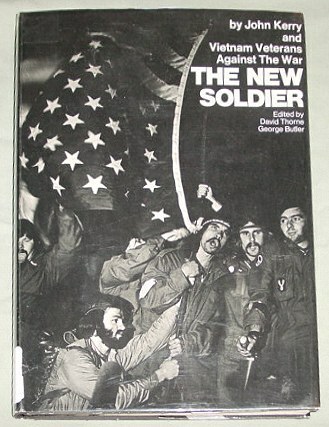 This book cover shows the American Flag being held upside down by a group of anti-war protesters who were publicly praised by Vo Nguyen Giap, the North Vietnamese general in charge of the military campaign that finally drove the U.S. out of South Vietnam in 1975. Presidential candidate John Kerry wrote this book. Update: He also testified before the Senate Foreign Relations Committee about the excesses committed by servicemen in Vietnam. What he failed to say was where he got his information about these atrocities. It turns out that he was spouting disinformation created by the KGB to disrupt the US war effort. Ion Mihai Pacepa, a spy chief and a general in the former Soviet satellite of Romania, produced the vitriol Kerry repeated to the U.S. Congress almost word for word. He aligned himself with Jane Fonda and the anti-war movement, and even got himself arrested during one protest. I don’t fault him for protesting the war – it’s the fact that he now speaks only about his meritorious service in Vietnam, never about his anti-war activities. If he was sincere then, why not speak out now? Kerry would have us believe that he has the military experience and maturity to conduct the affairs of our nation. I don’t think so. I distrust a person who changes his position and then denies that he ever held the old views. This book is now a source of embarrassment for him. It takes a lot of moral fiber to be president and hold firm to what you feel is the right thing to do. I think there are other candidates who will make better presidents. Thanks to Cox & Forkum for the link. Hmmm… I find it odd that you believe that changing your opinions shows less integrity then refusing to change your opinion. John Kerry was quoted in 1971 when he went before the senate foreign relations committee, “How do you ask a man to be the last man to die for a mistake?” I admire that stance and I completely understand why he would not want to stand up now and say it. Basically in politics you must whitewash your past of sound bites that are usable against you. The current administration has been amazing at this. Denying media coverage to news reporters and or newsgroups that promote a negative opinion has even done wonders to hush up many minor issues that you can read about in England. Bush has more unified political power and can control media better. For that reason alone the front runner of the democratic party will need to distance them self from misquotable statements. It is sad but democracy does not reward truth or integrity as much as it rewards connections, PR, and money. With enough of each you can pretty much make up the history you want to have and shove it down the throats of the populace. It doesn’t have to be true, just ubiquitous. Politics are immoral. It seems you have to be an immoral person to do well in it. Good and honest individuals do not make leaders, because they are not willing to climb over the bodies to get there. However, I didn’t assign integrity to changing or not changing opinions. I have done both myself. What I object to in a candidate or in anyone else, is the denial of having held an opinion when the opinion was held. Dishonesty is not an admirable character trait. I am not sure that any of the current candidates is without fault. I will select the one I find to have the best combination of praiseworthy actions and fewest faults.